Kandanga Valley Stud aim to breed consistently high performing Charolais and Charbray cattle to suit every environment. We turn off approximately 150 bulls per year – which is why Bulls are our Business. We are located in the beautiful Kandanga Valley, 30 minutes south west of Gympie. Our herd consists of over 500 registered Charolais and Charbray breeders and a few commercial unregistered females who’ve earnt their keep. 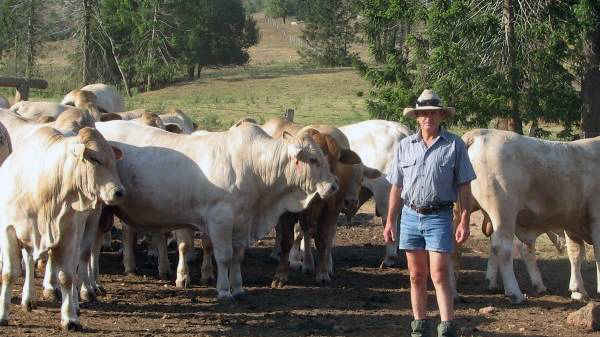 The cattle running in the Gympie area are exposed to high tick pressure and are managed as a commercial herd would be. There is no room for inferior free loaders at Kandanga Valley. Charolais bulls bred at Moonie are moved to Kandanga and well acclimatized prior to sale time. Kandanga Valley cattle have been proven performers in any environment time and again, with many satisfied buyers across four states and in many different conditions. Most Charbrays are run on properties in the general Gympie district of Queensland, Australia. Two properties in the beautiful Mary Valley, southwest of Gympie consisting of 1400 acres, and also a leased block at Glastonbury, west of Gympie. Our Charolais breeders are run in clean country now on a property west of Moonie. The country varies from high rainfall red soil forest to scrub country with some irrigation flats at ‘Warravale’, Kandanga, and western downs country at Moonie.